US benchmark bond yields declined during Tuesday which was an important factor hampering the dollar, although losses were concentrated against the yen. The US currency was still protected by reservations over European currencies with little change on a trade-weighted basis. Crude was hit by a correction after Russia indicated output was likely to be increased from June, but with solid support on dips. The Canadian dollar retreated from 2-week highs. Equities lost ground on global trade uncertainties, but Chinese gains curbed wider losses. Precious metals secured limited gains as USD/JPY retreated. Sterling was hampered by a lack of positive political developments and caution ahead of the EU Summit despite expectations that a further Brexit extension would be approved. According to reports, Italy will cut its 2019 GDP growth forecast to 0.1% from 1.0% which had a slight negative Euro impact. The US NFIB small-business confidence index strengthened slightly to 101.8 for March from 101.7 previously and above consensus forecasts. The labour-market data remained robust with upward pressure on wages, although pricing pressures eased slightly. The JOLTS data recorded a decline in job openings to 7.1mn for February from 7.6mn the previous month. There was also a decline in the number of hires with little change in separations. IBD April consumer confidence declined to 54.2 from 55.7 previously, maintaining the recent choppy run of data and underlying doubts over the outlook. Concerns over the outlook for EU trade were eased slightly following EU Council President Tusk’s comments that talks with China had been tough, but productive and that there had been a breakthrough on subsidies. There was still caution ahead of Wednesday’s ECB policy meeting with expectations of a dovish stance, but markets wary over market volatility and short covering. The dollar recovered from lows against commodity currencies while EUR/USD settled around 1.1260 from 1.1285 highs. Fed Vice-Chair Clarida stated that the US economy is close to or at the inflation and jobs goals, maintaining expectations that the Fed would keep interest rates on hold in the short term. Minutes from March’s meeting will be released later on Wednesday with markets looking for further guidance on the 2019 outlook and the dollar was little changed in early Europe. Risk appetite was dampened to some extent by the latest IMF forecasts with the GDP growth projection for 2019 cut to 3.3% from 3.5% with the US forecast also cut slightly to 2.3% from 2.5%. US Treasuries rallied into the New York open with the 10-year yield dipping below the important 2.50% level which undermined potential dollar support. Wall Street equities also opened lower which curbed yen selling and USD/JPY dipped to test the 111.00 level as oil prices also corrected lower. Japanese core machinery orders increased 1.8% for February after a 5.4% decline the previous month with little impact on confidence in the outlook. Asian equities lost ground on Wednesday with underlying uncertainty over global trade policies curbing buying interest amid subdued trading volumes. The US 10-year yield was held just below 2.50% which curbed potential dollar support, although USD/JPY did hold just above the 111.00 level as markets waited for trade developments. Sterling moved sharply higher ahead of the New York open following rumours that the German government would propose a 5-year time limit on the Northern Ireland backstop. These reports were, however, denied quickly and gains reversed. The currency was protected to some extent by reports that no EU state had argued to block a Brexit extension. A willingness to extend was confirmed in the draft EU statement, but exact dates would not be agreed until the Summit. There was, therefore, still an important element of caution ahead of Wednesday’s Council meeting with the risk of major tensions if Prime Minister May’s request is unconvincing and conditions are likely to be imposed. There were also concerns that no significant progress was being made in talks between the government and Labour Party and internal political tensions remained intense. With a slightly more cautious risk tone, GBP/USD retreated below 1.3050 from 1.3120 highs and EUR/GBP advanced to near 0.8650. The UK currency gained some ground in early Europe on Wednesday with EUR/GBP near 0.8620 and GBP/USD around 1.3070. Choppy trading is inevitable during the day and there will be substantial Sterling losses in the unlikely event that a Brexit extension is blocked by the EU. The Swiss currency moved lower during European trading on Tuesday with a further net shift into higher-risk assets as global commodity prices moved higher. There was an element of optimism that the global economy would show stronger growth later in 2019. The franc was also undermined by negative interest rates and aggressive National Bank policy. Selling eased as US equities moved lower and trade concerns persisted, but EUR/CHF held above 1.1250 while USD/CHF made a fresh challenge on the parity area without a sustained break. The Australian dollar continued to draw support from a weaker US dollar ahead of the New York open with AUD/USD strengthening to 0.7150. There was a retreat later in the session as the US currency recovered ground and risk conditions turned slightly more cautious. Reserve Bank Deputy Governor Debelle stated that the jobs market had been surprisingly strong, but the output data had been weak and the resolution of these conflicting pressures would be crucial for policy. The Australian dollar was able to make net gains, but AUD/USD stalled ahead of 0.7150. The Canadian dollar drew further support from gains in oil price and USD/CAD dipped below 1.3300 which triggered stops to 2-week lows near 1.3280. Crude dipped lower after Russia’s warning that it did not want uncontrolled price gains and USD/CAD moved back above 1.3300. There was a further loss of traction later in US trading and the pair consolidated around 1.3325 on Wednesday. The Norwegian krone maintained a strong tone during Tuesday on expectations of further interest rate hikes. A correction lower in oil prices did trigger a currency retreat with EUR/NOK recovering from lows around 9.6150 and trading just above 9.64 at Wednesday’s open. Norwegian consumer prices increased 0.2% for March with the headline inflation rate at 2.9% from 3.0% and above consensus forecasts of 2.8%. Core prices rose 0.3% with the annual rate increasing to 2.7% from an upwardly-revised 2.6% and above expectations of 2.5%. There was little net change in the Swedish krona during the day with EUR/SEK settling around 10.42 and the krona gained in sympathy with the Norwegian currency on Wednesday with USD/SEK just below 9.25. Unease over trade prospects hindered Euro-zone equities during Tuesday, especially after aggressive US rhetoric on tariffs. With a more defensive US tone, there were net losses amid position adjustment ahead of the ECB meeting. The Eurostoxx 50 index declined 0.6% with a sharper decline of 0.9% for the German DAX index. Major UK equities were protected by Sterling losses, but there were fresh concerns over the political impasse and the global tone was less positive while oil prices corrected lower. Overall, the FTSE 100 index declined 0.35%. Uncertainty over the US growth outlook and trade policies undermined Wall Street confidence and there was pressure for a correction after 8 successive gains, but major indices recovered from lows with the S&P 500 index declining 0.6%. 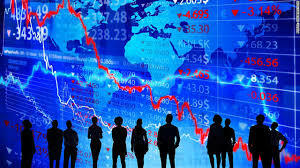 Caution prevailed in Asia on Wednesday, although selling pressure was limited with solid buying on dips. Japan’s Nikkei 225 index declined 0.5% as the dollar lost ground while the Australian ASX index was little changed as a dip in the resources sector eroded support. China’s Shanghai index traded 0.5% lower in late trading with a strong recovery from intra-day lows while the Hong Kong Hang Seng index traded 0.1% lower. Oil prices were undermined by comments from Russian President Putin that he did not want an uncontrollable rise in oil prices. There were also suggestions that Russia would increase output from June. Crude was also hampered by lower IMF growth forecasts. Supply concerns still provided net support and, after a dip below $64.0 p/b, WTI recovered ground to trade just above this level. API data recorded a larger than expected inventory build of 4.1mn barrels compared with consensus forecasts of 2.3mn, but there was a sharp decline in gasoline stocks which underpinned sentiment with WTI around $64.20 p/b. WTI held above $64.0 p/b on Wednesday with Brent trading around $70.75 p/b. Gold drew further support from a weaker US dollar tone and also gained protection as global equity markets lost ground. Gold gradually strengthened to the $1,305 per ounce area and held above $1,300 on Wednesday, although it was unable to extend gains while silver lost ground and traded around $15.15 per ounce on Wednesday. Cryptocurrency volatility subsided during Tuesday with a narrowing of ranges, but overall sentiment held firm with solid buying support on dips. The ability to resist losses on expectations of tighter regulation from China was important in boosting confidence with optimism that any ban on mining would curb supply and support prices. Bitcoin found support on approach to $5150 and traded above $5200 on Wednesday. Ether drifted marginally lower during the day, but found support above $175 and was just above $180 on Wednesday.